Preparation for Capital City Championships Underway! Posted on February 22, 2017 | Comments Off on Preparation for Capital City Championships Underway! Tournament preparation for the Capital City Championships on March 18, 2017 is now underway. Karate students who are competing are all invited to training camp every Sunday at 1pm. Also, all Muay Thai students who are competing should attend sparring every Friday at 6pm. BJJ students who are competing will be part of competition training every class. Registration is now open at Arashido.com. All competing students must notify the instructor they plan on competing! Comments Off on Preparation for Capital City Championships Underway! Honey Badger Kids Camp Underway! Posted on July 27, 2016 | Comments Off on Honey Badger Kids Camp Underway! The Honey Badger Kids Camp run by Muay Thai Champ Derek Jolivette started this week and the kids are having a blast! The camp runs from 9:30am -3pm every day. The day starts with some team-building exercises before getting into some hard-core training. Then the kids have some lunch and go outside to the park for outdoor training and activities. Day 1 the kids played soccer, ran a relay race, basketball and a bit of free time on the park apparatus. On Day 2 the kids had an awesome and very competitive kickball match. The afternoon usually involves some more training in the dojo before the kids get to close out the day with a Nerf Battle in the Dojo. So far everyone is having a blast and this is the largest Honey Badger Kids Camp to date! Comments Off on Honey Badger Kids Camp Underway! Here is the news and notes for July and August 2016. The dojo will be closed next weekend on Sunday July 31 and Monday August 1 for the August long weekend. There will be open mat on Monday from 6pm-8pm. The same goes for the Labour Day weekend on Sunday September 4 and Monday September 5. There will be no open mat on Labour Day weekend. Summer Grading for stripes, belts and prajieds will take place Wednesday August 17, Thursday August 18 and Friday August 19 during regular class times. Check at the front desk starting in August to see if you are eligible for grading. A more detailed list will be available soon for students training throughout the summer. Fall Cleaning will take place on Monday September 5 (Labour Day) from 12pm – 4pm. We will be cleaning the dojo from top to bottom for the fall season. Anyone who would like to volunteer is welcome to join! There will be a team paintball and barbecue day on Saturday September 10. instructor Mike Chandra is organizing the event. Anyone who is interested, please put your name on the list at the front desk. You are welcome to participate in either the paintball game, the barbecue or both! Next weekend is Heritage Days at Hawrelak park. Arashi Do Sherwood Park has a large group of people who are part of the Arashi Do Official Muay Thai Demo Team. They will be performing Muay Thai demos every day of the festival at the Thai Pavilion at 12pm, 2pm and 4pm. If you are planning on going to Heritage Days stop by and say hi! The Honey Badger Kids Camp is a Martial Arts based summer day camp for kids. The kids will train in martial arts two sessions per day under the direct supervision of the WKA World Champion and Certified Muay Thai Instructor Derek Jolivette. This camp is open to kids ages 7yrs up to 15yrs and includes all kinds of fun group and team-building activities, field trips, top notch training (lunch is not included). Arashi Do Sherwood Park’s Muay Thai fight team will be participating in the IKF World Classic in Orlando Florida at the end of July. Matt, Lilian, Cora, Tim and Derek will all be heading down to represent our club and our country at this world level tournament. The team is training extremely hard 6 days a week. The divisions are posted online and we are excited to see competitors from all over the world meeting in Orlando to compete. Sensei Ryan has been working with a sports psychologist and the team is implementing new tactics and techniques for training moving into this tournament. The team has been implementing visualization, video analysis, and other sports psychology techniques used by Olympic athletes in the hopes of bringing our team the gold! If you see the team around the dojo wish them luck as they hit the difficult part of their training camp this upcoming week. Thank you everyone for your support! 2016 Summer Training has begun! Posted on July 11, 2016 | Comments Off on 2016 Summer Training has begun! Come in and try a free class and see which program works best for you! Comments Off on 2016 Summer Training has begun! We will be having a big PARTY at the dojo this Saturday July 4 starting at 5pm to celebrate Kru Derek’s 30th birthday. It is a potluck dinner/ dance with live music, games and fun for all ages. There is no admission fee to attend this party and everyone is welcome. Come celebrate! We will be closed for Canada Day on Wednesday July 1. We are pleased to announce a new schedule for the fall starting in September. We will be offering 4 classes per week for the following classes. You can upgrade to 3 or 4 classes per week starting in September. Also, we will be moving all Saturday classes to Sundays starting in September to avoid consistent conflicts with tournaments and events always occurring on Saturdays. Class times will remain the same. GRADING will occur on the following dates. Grading costs $35 for the belt/prajied and certificate. Please see the list at the front desk to confirm if you are testing for a new belt or prajied. This summer we have a bunch of people attending major tournaments all over the world. Good luck to our competition team in their travels! Unfortunately we have to re-schedule all kids Muay Thai classes this Saturday June 13 for the Arashi Do Annual Instructors Meeting at Battle Lake. All instructors including junior instructors will be renewing their instructor training. There will be make-up classes the day after on Sunday June 14 at the same time. There will be a Big Birthday Bash for Kru Derek’s 30th Birthday on Saturday July 4 starting at 5pm at the Dojo. There will be a live band, a potluck dinner, games, dancing and fun. The party is open to everyone of all ages. Since Kru Derek is turning 30 years old we are suggesting a donation of $30 per family (or whatever you can afford) to send Kru Derek to Bangkok in August for the IFMA World Championships. Donations encouraged to help Kru Derek get to World Championships in August! 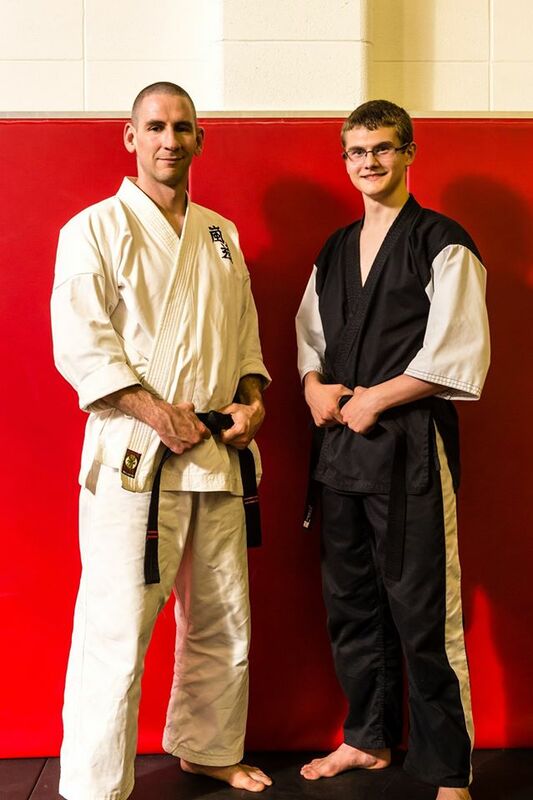 Congratulations to Sensei Liam Dalton who achieved Senior/Adult Black Belt in Karate this past weekend in Red Deer. Sensei Liam has been with Arashi Do training in Karate for almost a decade and showed a very high level of skill, fitness, determination and Relentless Spirit during the very difficult 5 hour examination. Sensei Liam is the first Black Belt in Karate to come out the Sherwood Park Dojo! No Junior Muay Thai or Tiny Thaigers classes on Saturday April 25 due to the BJJ Symposium. We host this event twice per year and students come from all over Alberta for grading and seminars throughout the weekend. Thank you for your understanding. The Arashi Do Behring Jiu Jitsu Symposium is coming up Apr 24-26. The Symposium is a very special event that takes place twice per year every April and October where students grade for belts and stripes under our Master instructor Sylvio Behring 7th degree Red and Black Belt from Rio De Janeiro Brazil.All junior and senior students must attend the symposium in order to grade for belts and stripes. The Mini Monkeys students do not grade at the Symposium but there is a fun class where students can meet Master Behring and learn directly from him on Sunday April 26. Registration is now open at the front desk for the symposium. Fees must be paid in cash only please. Arashi Do is proud to announce its second ever Advanced Karate and Muay Thai Symposium on Saturday May 9 at the Red Deer Dojo. There will be amazing seminars and gradings for both advanced Karate students (Blue Belt and above) and Advanced Muay Thai students (Testing for Orange Prajied and above). If you are wondering if you are testing please check at the front desk for a full list of candidates. Belt fees are payable the day of grading. To confirm if you are testing for a belt please check at the front desk if you are unsure. There will be a special Karate Brown Belt prep class for students testing in Red Deer. This prep class will take place during open mat on Saturday May 2 from 11am-1pm. ALL STUDENTS testing for Brown Belt MUST ATTEND. Additional self-guided practice for Karate Brown Belt students is taking place upstairs every Tues & Thurs from 6pm-7pm. We will be closed for Spring Break from Fri Apr 3 to Mon Apr 6. We will re-open for regular scheduled classes on Tues Apr 7.There will be open mat on Mon Apr 6 from 6-8pm. Congratulations to our Mini Monkeys, Junior BJJ and Muay Thai class on a successful stripe, belt and prajied testing! Excellent job everyone!